Montespertoli is one of the largest municipality of the province of Florence, which is only about 20 kms far from. 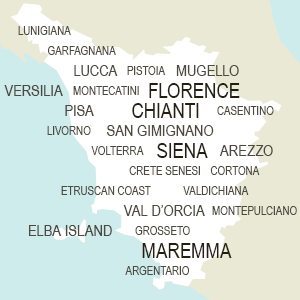 It borders some of the most important geographical areas of Tuscany, such as Val di Pesa, Val d’Elsa and Chianti; to be more precise, since a few time part of the Chianti zone has been named Montespertoli, including those lands of Montespertoli that are aimed to the production of the renowned red wine. There’s also a celebration dedicated to its most famous local product taking place from the last Saturday of May till the first Sunday of June, called Mostra Mercato del Vino Chianti (literally, Exhibition market of Chianti Wine), supposed to promote this local wine variety. Recently, a great flow of people has moved from Florence to Montespertoli looking for a better lifestyle far away from the city chaos (but at the same time close by and easily reachable) and a great number of rural accommodation has popped up in the territory as well, offering a varied offer to all green tourist searching for relax and proximity to the Renaissance art homeland. Set in an ancient Franciscan convent in the hills around Florence, this luxury hotel offers charming rooms and stunning views over Florence's historical center. Located near the medieval town of San Gimignano and immersed in the countryside, this typical farmhouse offers nice and comfortable apartments with swimming pool. Surrounded by beautiful countryside it is conveniently located outside Florence, a 10 minutes bus ride. The farmhouse is set in a 14th century building and has private stables. Rooms are cozy and have all comforts. Located near Florence Certosa, few miles from the city center it offers great views over the countryside. Set in a 14th century hamlet with a Medieval tower, it offers elegant and spacious rooms. It includes a large garden with pool. As well as all villages situated in Chianti area, Montespertoli is renowned for its wine, especially since the end of 90’s, when part of the sub-area Colli Fiorentini was renamed Montespertoli, and consequently all wines produced around this zone received the official quality denomination. Montespertoli is also a perfect location for spending a holiday in Tuscany, since it is a few steps away from Florence city center (and on the way to Pisa as well), which is easily reachable by car, bus and train, and immersed in Chianti countryside at same time, which offers amazing views on the surrounding hills. That means that you may enjoy country life and its rural traditions, being a stone throw from art museums, monuments, churches and all that a city like Florence may offer. If you really want to enjoy a typical Tuscan experience, go and visit Montespertoli around the end of May: there’s a local fair dedicated to Chianti wine, during which not only wine, but also local specialities are celebrated all week long. Do you still have any doubt about this village? Check our list of accommodation in Montespertoli near Florence, you’ll be charmed by our villas and farmhouses.